Ahead of Independence Day earlier this week, a similar circular from the MHRD had become a bone of contention between the PM Modi and Ms Banerjee governments. Programmes on PM Modi's "Swachh Bharat Mission" to be held in schools on Teachers' Day. Kolkata: Days after clashing with the BJP-led central government over the format for celebrating independence Day in educational institutions, West Bengal's Mamata Baneerjee regime is again on a collision course with the centre over observance of Teachers Day on September 5. At the core of the dispute is a circular sent by Union Ministry of Human Resources Development to the states recommending a structured format that promotes Prime Minister Narendra Modi's pet scheme "Swachh Bharat Mission" across the nation through the programmes to be organised in the schools on Teachers' Day. 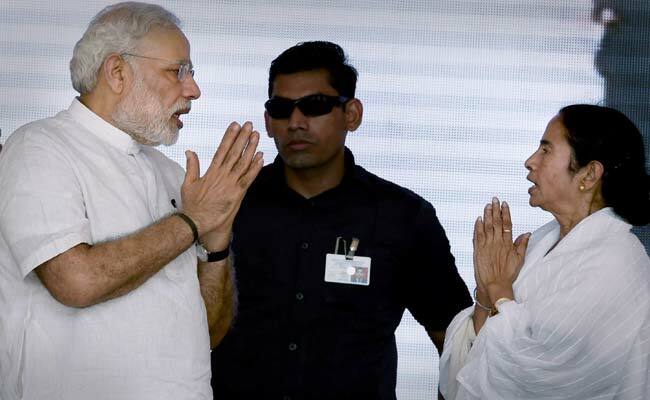 The Trinamool Congress state government, which has emerged as one of the staunchest critics of the Modi government, on Saturday made it clear that it was in no mood to abide by the "recommendations". Describing the circular as "laughable", state Education Minister Partha Chatterjee said: "We on our part have sent circulars to all schools in advance to observe Teachers' Day with due reverence and solemnity. All educational institutions will observe the day." The HRD Ministry circular refers to the recommendations as "suggested" by PM Modi to engage schools children in the "Swachh Bharat Mission" through national level essays and painting competitions. "The honourable prime minister has suggested to promote the message of 'Swachhta' on a massive scale and engage smart, young minds in the Swachh Bharat Mission through national level essay and painting competitions organised across all schools on occasion of Teachers Day." "This initiative would ensure a structured participation of the school children, youth in the programme and bring in fresh ideas, energy and enthusiasm to the mission," says the circular. The painting completion would be for students from class 1 to 5 and the essay competition for students in two categories - one for class 6 to class 8 and other for class 9 to class 12. The circular proposes that the theme of the essay competition should be "What will I do to make India clean", and that for the painting competition "Clean India of my dreams". The circular recommends that every school "strongly encourage all students to participate in the essay and painting competition" and calls for giving awards to the best essays at the village, district and national levels. "I don't know why they have sent this circular. Do they feel we don't know how to observe the day?" asked Mr Chatterjee, while categorically stating that the schools would organise programmes on their own, just as they have been doing for years on that day. Perhaps as a counter to the BJP led government's move, the Trinamool dispensation in the state has decided to hold a central programme in the city where Chief Minister Mamata Banerjee would launch a scheme for distribution of schools bags and exercise books to students. Teachers of schools, colleges and universities would be honoured with certificates and medals during the programme. The union ministry had issued the circular to all state Education Secretaries specifying "additional activities" to be undertaken by schools under the Sarva Shiksha Mission to celebrate Independence Day in a "befitting manner". The state government responded by issuing a directive to all District Project Officers in-charge of the Sarva Shikha Mission in the state, virtually negating the Union ministry circular and asking the schools to "Stop all preparations" for celebrating the day in the format prescribed the the MHRD.